Symphysis Menti a.k.a. Mandibular Symphysis is a slight median rim which is located at the external surface of the body of mandible. The line which shows the fusion that appears at the age of 2 years of the two halves of the mandible is indicated by symphysis menti. The point of chin is created by symphysis menti; the mental tubercle bounds the base of point of chin on both sides. The symphysis menti spreads out inferiorly within a triangular prominence known as mental protuberance. Upper pair gives attachment to genioglossus muscles. Lower pair gives attachment to geniohyoid muscles. Mental protuberance is a triangle-shaped prominence at the lower point of symphysis menti. At birth Mandible is in two halves, it gets merged via the fibrous tissue at the symphysis menti later at the age of two yrs. Mylohyoid line is a protuberant diagonal rim which goes obliquely inferior and anterior from at the back of the 3rd molar tooth approximately 1 cm inferior to the alveolar margin towards the symphysis menti underneath the genial tubercles. Anterior belly of digastric muscle originates via digastric fossa on the base of mandible near the symphysis menti. Anteriorly across the midline, the investing fascia of deep cervical fascia gets constant with its corresponding part of the other side. In the anterior midline from above downwards it is connected with symphysis menti, hyoid bone and jugular notch. 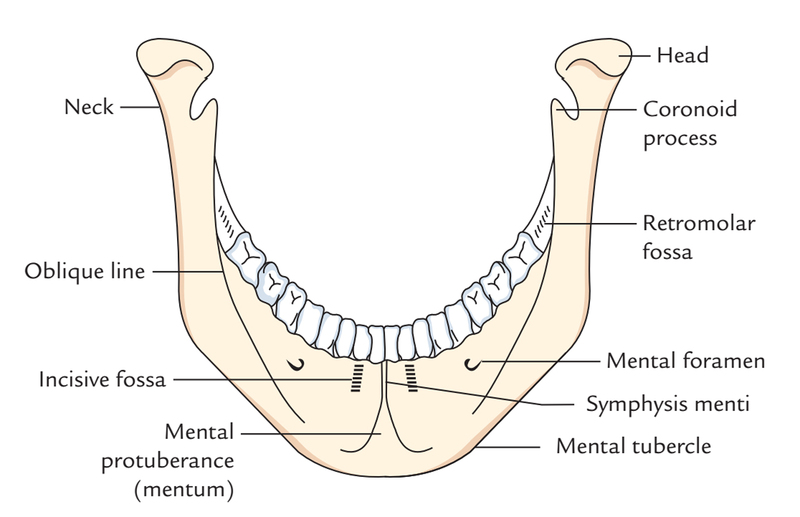 Mandibular symphysis and parasymphysis fractures arise in the zones in the middle of and comprising the mental foramina. In this zone oblique fractures appear frequently and are often overlooked on a plain X-ray film. Due to the narrow focal trough, the clarity of the image of the mandibular parasymphysis within a panoramic radiograph is fluctuating. Frequently a CT scan is required in order to indicate the presence as well as direction of the fracture more precisely.